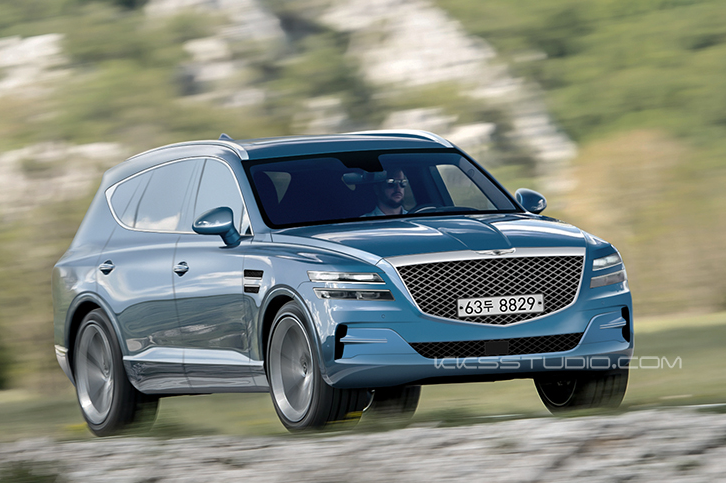 An updated render of the long-awaited Genesis GV80, a SUV that is needed to be at the Genesis line-up as soon as possible in order to raise up sales, specially in the US-market where the luxury brand is suffering strong sales falls, has emerged today. Today, and thanks again to our friend Kksstudio, who is always very accurate to the final designs, we can see and updated render of how the Genesis GV80 production model will look. Nowadays we have seen a lot of spy pictures of the GV80 (codenamed as JX1) including the interior for the first time today. The production version will use similar lines if you compare to what we have seen on the concept car and now we can confirm that the design will use elements of the GV80 concept like the Quadruple LED headlights and taillights or the front grille. Engine line-up for the GV80 will feature two new engines, the Theta III 2.5-liter Turbo and the Lambda III 3.5-liter Turbo, both engines will be showcased on the second generation G80 earlier next year. Final output will be from 300 hp to 400 hp. A 6-cylinder diesel engine is under consideration. The GV80 will share the same RWD platform as the G80 sedan and also will offer the HTRAC variants. The GV80 will arrive at the end of 2019.